I look at those magazine photos of a huge room with about three pieces of furniture in it and say “who lives like that?” Not my friends and I …..but, that sense spare, of space, of seeing the walls meet the floor, seeing the furniture all sit on a single rug, like an island, makes the room seem huge. When furniture is pushed up against the walls, the room feels closed in and the couch kinda comes out of the wall…, and the end tables become part of the couch and stuff starts knitting it all together until the walls and floor bend together. Give your furniture some space and the whole room will breathe, inviting you to sit in open space. 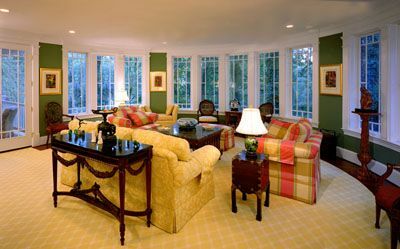 Group your furniture so that seated heads are no further than 10″ apart, and the couches or couch and chairs, and thus you and your guests, feel in relationship with each other. Especially in tighter spaces, I like my furniture to do double duty, where the coffee table is a chest for storing stuff, and the end tables have room below for newspapers or laptops, and the bookcase beside the fireplace hides the TV and drawers for DVD’s and the sound system, as well display with some lighting. Pick furniture that fits the room….the sofa doesn’t have to be huge and heavy looking..let the floor go under it,… and the chairs can be see-through with rounded backs allowing that extra critical few inches for getting around. A table behind the sofa can give some place to a sofa in a long narrow room, allowing the sofa to go across the space and not along the length of the room. The large round dining room table squeezes into the rectangular room while a 40″ rectangular table will sit everyone nicely. Or, built-in furniture can tighten up a grouping for a connected, cozy and integrated feeling, like fitting a breakfast table into a bay, or creating a vital niche space in a larger room. So, when it comes to furniture, I feel that less is truly more. Forgetting that clutter put away, see my blog on storage.